Walker added many excellent points to that talk. He picked all of the East Coast examples, and it was his discovery of the Herbie Hancock piece that convinced me that the coastal lines were being blurred all the way back in the 70's. I still feel what is happening right now is larger in scope though. I never thought I would see so many people interested in this topic! HP issue is recognized here. IMO and experience of owning the 0-coast briefly, the unit is small/portable enough that carrying it as an extra to a euro setup didn't concern me. More convenient to rack it if you have the space? Sure. Seems like MN is doing euro-goers a favor by making this standalone, but those who 100% will not check this unit out b/c it is standalone is silly to me. Mine is paired up with a SH-101 that acts as a keyboard controller and a sequencer. To make it truly portable, I may mod a 4s (14.8v) LiPo battery to provide power to the no-coast (the 101 runs off of C-cells). Add a pair of headphones and a battery powered mixer/recorder like a small Zoom and away we go. o-coast is a fun little box. so, if you want to run this on a eurorack psu, does this mean that you better apply +12v, -12v, and +5v respectively to the outputs of those 3 regulators, rather than just connecting the +15v input to +12v as suggestet by robot909? 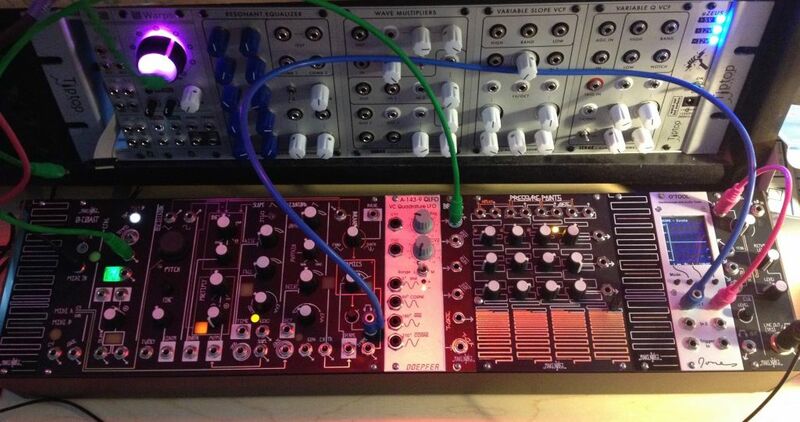 Would love to see Make Noise release a combination lithium ion battery pack/sequencer in the same case as the 0-coast. Anyone know of places that have these in stock? Same. Will be cool to see what people end up doing with it unhinged and out in the wild. ah, i see. thanks for clarifying your clarification! Put in an order for one after deciding I can sell enough stuff to fund it . Now I just hope I can still be part of the batch making it to europe soon having decided so late . Yeah I was told it would take two or three weeks still until they even know if they'll have enough stock. So I'm not holding my breath but at the same time I'm quite impatient. We started a 0-Coast FB group for tips and stuff last weekend. It's a closed group, but all are welcome. Already > 100 members. Just wanted to let you know. I'm appreciating the time to read the manual carefully, because you put a a great effort into making it. Edit: added the link to the official PDF. I saw they had a few up, but missed out. They put one back up the other night and I jumped on it. Should arrive next Wednesday. Is there a production setback Make Noise? I preordered one of these things over a month ago from one of your LA distributors and there is no hint in sight of these things being in stock any time soon.